I have been using internet banks for more than eight years. The first internet bank that I remember I used was NetBank in 1999. At that time, there aren’t many banks that offered savings accounts with decent rates. My local bank, Summit Bank (then Fleet Bank, now Bank of America), had a rate that was close to zero. So I was quite happy with what I got from NetBank and have used it for a while until other banks started to offer similar products with better rates. In fact, when I look back my banking history, I found I have used most of the banks in the online banking business. In addition to NetBank, other banks that were part of my banking system include: E-Trade Bank, Citibank, AmericanBank. The main reason for me to switch banks is the interest rate and that’s what I am going after. So if other banks offer better rates, there’s no reason to stick with the old bank. I want to get the best of my money, even it means I have to keep changing banks. A direct result, as you can imagine, is I had many closed account and still own half a dozen accounts as of now. However, all these activities are limited to only online savings account. I have only one Bank of America checking account and no internet based checking account, though the BoA account doesn’t ear me any interest. When ING Direct introduced their interest checking account last year, I have once considered whether to switch, but eventually abandoned the idea for reasons I explained before. I recently checked some online banks who provide high interest checking and savings accounts and put together a list to compare which bank offers the best deal. If you decide to let one bank host both your checking and savings accounts, then at this point the best choice is Presidential Bank. If you are looking for deals from big names, then ING Direct is still the one to beat. In the following, I used the combined yield of both the checking and savings account (simply add the yields of checking and savings accounts). However, that doesn’t mean you will get the combined yield. Instead, what rate you will get depends on how you distribute your money between checking and savings account. If, for example, you have 50% of your money in checking and 50% in savings, your yield will be half of the combined yield, which is only for the purpose of illustration. My feeling is if the combined number isn’t high, it’s unlikely you will get a good deal. Update: The original post was written on June 17, 2007. Since then, most of the banks have changed their rates significantly. For updated information, check out the Best Online Savings Account Deals page or the Best Interest Checking Accounts post. For rate history, go to Online Savings Account Interest Rate History page. 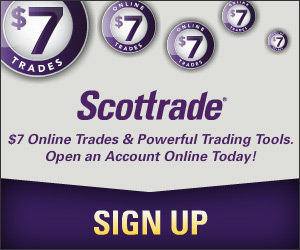 I used E-Trade many years ago when it was probably the only choice for online stock trading. In recent years, E-Trade has changed a lot after the once crazy online trading activities, and the profits, vanished. Now, in addition to being a brokerage firm, E-Trade also offers a full line of banking products with attractive rates. The combined checking and savings yield of E-Trade Bank is 8.30% APY. EverBank is known for its promotional rates. At 6.01% APY (but lasts only for three months), not many players can beat that rate. EverBank’s combined checking and savings yield is 8.41% APY. One product offered by EverBank that’s quite unique is their WorldCurrency Access Deposit Account. ING Direct is probably the first major bank to offer high yield savings account. Though their rates have lagged quite significantly in recent years, they still control the largest share of online deposits (Time Magazine, June 25, 2007). The combined checking and savings yield of ING Direct is 8.50% APY. With their newly launched Online Payment Account, HSBC also enters the interest checking market to compete with rivals such as ING Direct. However, one of the criteria I see as to be competitive is rate. At 5.05% APY, the savings account seems to be OK (I use HSBC savings account), but the 2.50% APY from the new checking account has nothing to be excited about. HSBC’s combined checking and savings yield is 7.55% APY. I never used this bank, but knew it for quite a while. Though the rate of their interest checking account seems to be quite decent, the savings account just offers a mediocre rate. The combined yield of checking and savings is 7.30% APY. Bank of Internet also offers 3.75% APY Senior Checking account if you are ago 50 or older. Additional benefits include $8 monthly ATM reimbursement and no minimum and no monthly fee. Hey, thanks for this…I’ve been eying ING and HSBC instead of using BoA savings for a better interest rate, and this was a great cheatsheat to save me the research. I thought you really can get the 8%+ since that’s the first thing that I saw in the article. With rates going higher and higher, I wonder if there will be a day when 10% CDs are possible again. Mike: I am glad that you find the information helpful. Between ING and HSBC, if you want to use only savings account, then HSBC will be a better choice. If both checking and saving, then you may want to use ING because it offers better rate for the checking account. What about Washington Mutual (WaMu)? If you open online both a free checking (no interest) with a savings account; the savings account will get 5% interest. FYI, I’m a current NetBank customer for several years now. Before that I used Security First Network Bank (bought by RBC) which was the first virtual online bank. I just saw last week that NetBank is selling out to EverBank. While I like what I saw at EverBank; I don’t like their high minimums on checking and savings/mma. I keep most of my cash/emergency fund in an ING Savings account. So, I’ll be switching my banking elsewhere. After doing research I’ve decided to go with WaMu. With their free checking, bill pay, checks, etc. and high interest savings it seems a good deal. Also, I get the benefit of physical branches to use. To date I’ve had two problems by not having a traditional B&M bank: getting a cashier’s check quickly for closing on home and needing medallion signature stamps for transferring investments between brokerages. I was considering ING Electric Orange, but in the end not having physical checks, no ATM fee refunds, etc. didn’t seem appealing to me. Also, I considered CitiBank, but when compared to WaMu the physical branches won out. I have recently switched to SalemFiveDirect.com. I am happy getting over 5% (depends on balance). Their billpaying is excellent. They give ATM refunds. I found one of the benefits of an online checking and savings account was access to the banks ATM networks and number of free ATM transactions. While the HSBC Direct checking rate is a bit lower than some competitors, access to almost 400,000 ATMs with three free withdrawals per month from non HSBC ATMs is worth the difference in interest rate. This is especially true if you keep your money in your savings account and only move the money you need each month for your bills. jt001: I know WaMu has good saving account offerings, the reason it was included in this post was they don’t offer interest checking account. Actually, I think it’s quite a good deal if there’s local branches in your area. I also have a B&M bank (Bank of America) and I don’t think I will ever get ride of it for the same reason as you mentioned. I like the convenience of making a quick deposit and getting cash whenever I need it and these can’t be replaced by a bank that does its business only online. But I only have checking account with BoA. All the savings go to online banks that are all connected to BoA. For online banks, I want the highest rate possible. Michael: Thanks for the information. I never heard SalemFiveDirect.com before and will check it out. Janker: It’s true that getting free ATMs and a high yield savings account together is very nice. I have HSBC account as well. Unfortunately there’s no branch in my area though I have a ATM card. the combined interest rates that you posted are rather meaningless and misleading, despite your explanation. also, a caveat regarding MMA should be included. MMA rates are not necessarily guaranteed or static in comparison to regular checking and savings accounts rates. As for the MMA, I feel there are more like savings account with rates stable for quite a long period of time. Since I don’t follow the rate changes, I don’t know how often it changes. HSBC just lowered their savings account rate to 4.5% APY. I know this article was posted almost a year ago, and interest rates are subject to change, but I was very dissappointed after following the links to find that all of the banks featured here have rates that are at least 2% lower than when this was written. Is it normal for rates to fluctuate that much over time? Is it likely that rates will continue to decrease? How do you know you’re getting the best rate if the rates are constantly changing? Angela: Yes, that post is a old one and things have changed a lot since then. If the Fed keeps cutting rate, which is expected when they meet again at the end of this month, then yes, banks will follow to lower their rate. I had several updates in the past when I tried to follow all the changes, but gave it up because the changes were dramatic and fast. What I think is that if a bank offered the best rate before the current cycle began, then they may still have the edge if they have reduced the same amount as other banks did. This is not always true though. What are the best ones you have found and how are they working for you? I am confused as to whether to take up a checking and savings for the apy rates or not. Ive been with venturebankdirect.com since the fall and have enjoyed a high yield on my savings account. Now they offer a high yield checking account online.